Shawn Yue(余文樂)'s basketball team Wan Chai Industrial(橫洲工業) was competing for a game in July last year. After the game was over, his teammate and former Hong Kong division basketball player Chan Sau Kin(陳守健) proposed to Shawn Yue's little sister Yue Man Kei(余文琪). 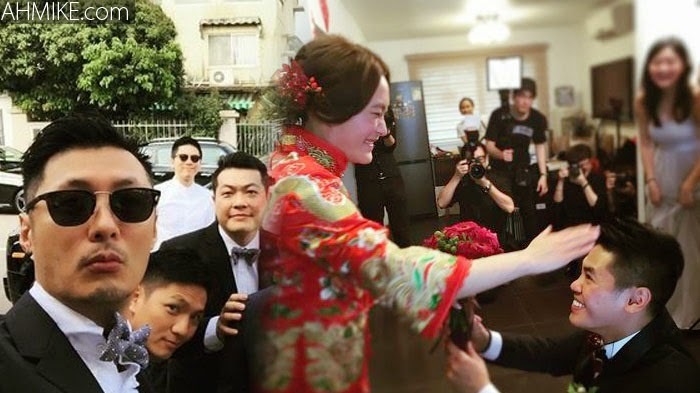 Under the witness of both sides' family members, Yue Man Kei happily accepted Chan Sau Kin's marriage proposal. After many months, Shawn Yue's sister is finally getting married today. Shawn Yue personally shared two pictures from her sister's wedding and wrote: "You have to be nicer from now on!" While Shawn's older brother Yue Man Hong was already married 5 years ago. Many people must be asking when is Shawn Yue going to get married! Regarding his sister getting married, Shawn said: "I am truly happy and touched at the same time! I finally completed my mission. I hope they can be happy forever!" When asked what did he give to the newly wedded couple, he said: "I think their biggest present is that I will always continue to support and love them!"